The Eco-ministry Intensive is rooted in the desire to create a resilient and thriving Earth community in support of a regenerative future. It is about courageously questioning our core beliefs and life styles and prophetically imagining what is life affirming for the whole. For many of us who are religious leaders, chaplains or spiritually grounded professionals, our call to ministry is being challenged by the anxiety and unrest that so many are experiencing in this time of disruption, injustice and uncertainty. In this intensive, we will explore what it is to embody a faith based activism rooted in the commitment to protect the sacredness of the Earth. We will respond to the invitation to open to the wonder of being part of a creative, living universe and to rediscover our deepest belonging—to ourselves, to each other, to the Earth and to the greater mystery. The first is to take an honest and deep look at the impact of living within a modern industrial, extractive and exploitive system, as we look towards what it is to create an ecologically and socially just framework—where all beings co-exist peacefully and freely in balance with a thriving Earth. Our guest faculty are dedicated to this work and will help us consider the challenges and opportunities of moving out of the predominant story of separation towards one of (inter) connection, equity and care. The second is to ‘re-awaken’ to ourselves, to each other, to the land and to the impulse that calls each of us to contribute to the world in our unique way. When we awaken to our inherent place within the larger unfolding web, we reconnect with the same creative force (God - Life - Spirit) that unfolded over time to bring forth the Himalayas and the hummingbird, as well as each one of us. The invitation is to become more adept at listening and responding to this emergent creative force—our own deepest nature—and to directly engage with how this force is coursing through and informing each of us. The third is to listen for emerging Earth liturgy that wants to be born in support of the communities we serve while exploring our roles in ministry and community care. As we open to how we might spiritually guide our faith groups into awakened connection and action, we will consider ideas for institutional and non-institutional eco-ministry service. By coming together in community and engaging in mutually reflective encounters with the land and with each other, we will create a vibrant ecology that invites us to root in that which lies beyond our differences—that which continually adapts, intelligent and resilient, through the cycles of time and change—and connect with the impulse to become an enhancing and regenerative presence to all of Life. 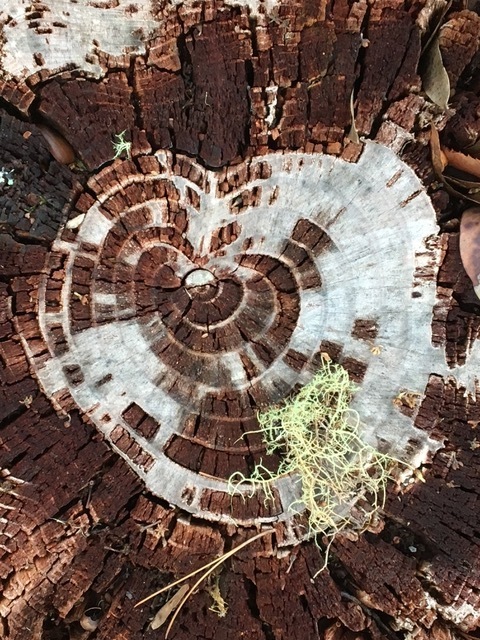 As a community, we will live and learn from the land, drawing from the new sciences, nature-based processes, listening meditation, inner and outer tracking, inquiry, dream-work, somatic resiliency work, council practices, ceremony and other time-tested processes that usher us towards dissolving our borders and embodying our deepest belonging. Our first two nights take place at the Occidental Arts & Ecology Center (OAEC), an 80-acre research, demonstration, education, advocacy and community-organizing center in West Sonoma County that develops strategies for regional-scale community resilience and a just transition for biological and cultural diversity. At OAEC, we will see a wide array of permaculture systems in action and enjoy the newly renovated facilities, pond, hot tub and comfortable eco-dwellings. After OAEC, we will move to nearby Bohemian Preserve (Boho) where we will immerse in the rhythms and cycles of the land. Boho is a spectacular ecosystem marked by active waterfalls, coastal prairie meadows, old-growth fir and oak woodlands that dwell in serpentine soils. At both locations, we will be blessed with local, organic meals by fabulous chefs who will nourish us with their food and beaming presence. Note: In order to support greater intimacy and connection with the Earth, we will be sleeping in tents, living comfortably on the land. This is an opportunity to re-connect with our innate rhythm and re-discover our deepest belonging, where we are nourished and informed by the whole. 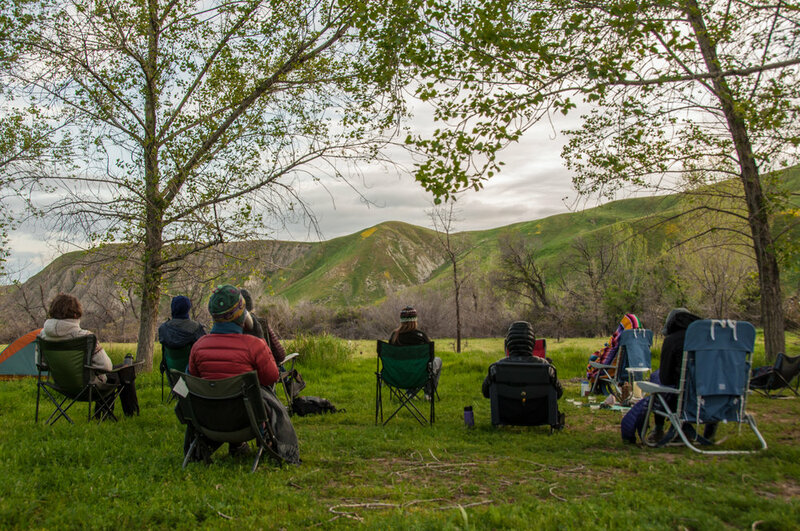 Many who have never or seldom camped are deeply fed by the discovery of their love of being immersed on the land. A limited number of special accommodations (pre-set up, roomy tents with padded cots) are available, on a first come-first served basis for an extra $50/night for non-inclined campers, those with physical limitations or those traveling from afar. Please email info[a]ecologyofawakening.org to inquire about availability and to handle payment which is separate from registration. We seek to make this retreat available to all who are called: please note that you do not need to be in top physical shape to attend; yet we require that each person be in good physical, mental and emotional health. We will provide a list of equipment upon enrollment and can assist you with where to buy or borrow equipment if needed. The Eco-Ministry Intensive is for religious leaders, chaplains or spiritually grounded professionals who have an active congregation, spiritual community and/or ministry. Professional activities should include significant time interacting with those seeking religious/spiritual guidance or support. We welcome and encourage all traditions. To help us ensure that the program is a fit for you, we’ve developed an APPLICATION (button at bottom of page). All information will be strictly confidential. Monday, June 3, 10:00 AM - Saturday, June 8, 1:00 PM 2019; as well as a pre-retreat Zoom call with Brian Thomas Swimme on Wednesday, May 22 at 3:00 PM PDT and a post-retreat Zoom calls (Date TBD). Both Zoom calls will be recorded for those who are unable to make the dates, although we highly encourage you to be with us if possible. Bohemian Ranch, Occidental, West Sonoma County, California. For those who wish, carpools will leave Berkeley early June 3rd in order to be on time for our 10:00 start at OAEC in Occidental. Sliding scale $1,895 - 1,295; **For Chaplaincy Institute students: Please send an email to admissions[at]chaplaincyinstitute.org to receive academic and/or continuing education credit. We aim to balance the actual cost of running programs with our commitment to make our offerings as accessible as possible to those who are called. Please know that our pricing greatly underestimates the number of hours that our team spends preparing, organizing and facilitating. Additionally, we keep our programs to a maximum of 16 in order to facilitate optimum engagement between guides, participants and what emerges while living in community on the land. Thanks to a generous grant from The Riverstyx Foundation, we are able to offer this program below our actual cost. For the Eco-Ministry Intensive, we have put together a powerful curriculum, with highly regarded, seasoned faculty who have dedicated their lives to creating resilient and thriving human and Earth communities in their own unique ways. Tuition includes all course instruction, course materials, OAEC housing and meals, camping fee, guide support and local, organic meals prepared by our fabulous chef, Hira, who puts her whole heart into each meal. It does not include transportation costs to or from Occidental. We offer financial support through sliding scale fees as well as partial scholarships. The sliding scale structure helps to make retreats more affordable for those who would not be able to attend otherwise. $1,895: This tier covers our basic costs and makes this opportunity available to others. $1,595: This tier covers our basic costs. $1,295: This tier is set below our actual per person cost and is designed to create more access. We are committed to diversity and equity and aim to price our program to support inclusivity and access. Thanks to financial support from the Riverstyx Foundation, we are able to offer assistance to those who are called to the Eco-Ministry Intensive and are currently limited in their finances. If you are called to the program yet unable to pay the above fees, we encourage you to apply for scholarship support, as we want to work with you. Scholarships are partial in that we ask you to pay what you can afford with the hope that we can make up the difference. Scholarships are contingent on the amount available, so best to inquire early. We take into account each individual circumstance and do our best to support each person’s needs. To request scholarship support, please first apply to the program (button below) and, if you are accepted, we will then send you an application for scholarship.